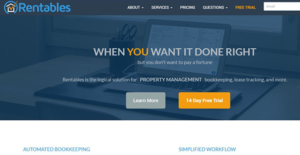 Retables is an easy-to-use, cloud-based property management software that helps rental property managers streamline all accounting procedures related to properties, tenants, owners, and trust accounts. It is a reliable solution for property managers who are getting started or those who have expanded to a few hundred properties. The platform simplifies property management workflows, automates bookkeeping, and allows managers to collect rent online and pay owners via direct deposits. Rentables systematizes the basic property management tasks including reconciling bank accounts, sending of lease renewals reminders, and recording monthly rental fees. It also features powerful work order management tools that enable property managers to stay in control of every work order and maintenance request. Other notable features include customer relationship management, owners portal, tenant portal, payment processing, and trust account management. Rentables is the go-to property management solution for local real estate agents and residential property management companies handling 3 to 300 units. Unlike the legacy spreadsheet and ledger programs, this an efficient software designed primarily for property managers in small and medium-sized companies. It is a reliable platform that requires no accounting experience to use. The program relies on a simultaneous accounting technique which means all the required ledger entries are automatically made when a transaction is recorded. Additionally, Rentables is built to match your needs and offer better value while reducing the clutter. It is an ideal alternative to the property management-centric solutions that have many complex features and requires a lot of clicking around. Its dashboard brings actionable information and insights at your fingertips to help you grow your business and make decisions confidently. The solution also comes with an integrated Automated Clearing House (ACH) payment functionality designed to simplify electronic funds transfer. This functionality integrates with other Rentable’s property management features, but can also be used as a standalone function. One key benefit of the ACH is that it automates payments and permits the tenant to pay rent directly from a verified checking account via the tenant portal. It also eliminates the hassle of running to the bank to pay owners. You simply select a bank account with a few clicks and automatically initiate direct deposit to pay property owners. Better still, Rentables allows you to generate and email property owners statements and keep them updated on property status. The owner can utilize the owner portal to check the status of bank accounts at their convenience. This saves you the phone calls and keeps all property owners satisfied. If you are considering Rentables it could also be a good idea to investigate other subcategories of Best Real Estate Management Software collected in our database of B2B software reviews. It's essential to realize that hardly any app in the Real Estate Management Software category is going to be a perfect solution able to meet all the requirements of different company types, sizes and industries. It may be a good idea to read a few Rentables reviews first as specific software may excel only in a really small set of applications or be created with a very specific type of industry in mind. Others may work with an idea of being easy and intuitive and therefore lack complex elements needed by more experienced users. You can also find services that support a large group of customers and provide a rich feature toolbox, but that frequently comes at a higher price of such a software. Be certain that you're aware of your needs so that you purchase a service that offers all the elements you search for. How Much Does Rentables Cost? We realize that when you make a decision to buy Real Estate Management Software it’s important not only to see how experts evaluate it in their reviews, but also to find out if the real people and companies that buy it are actually satisfied with the product. That’s why we’ve created our behavior-based Customer Satisfaction Algorithm™ that gathers customer reviews, comments and Rentables reviews across a wide range of social media sites. The data is then presented in an easy to digest form showing how many people had positive and negative experience with Rentables. With that information at hand you should be equipped to make an informed buying decision that you won’t regret. What are Rentables pricing details? What integrations are available for Rentables? If you need more information about Rentables or you simply have a question let us know what you need and we’ll forward your request directly to the vendor.